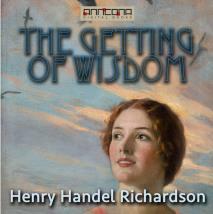 The Getting of Wisdom, by Henry Handel Richardson, tells the story of Laura Rambotham, a 12-year-old girl who is just starting at her boarding school. The author's family lived in various Victorian towns and from the age of 13 to 17 Richardson attended boarding school at the Presbyterian Ladies' College in Melbourne, Victoria. It's this experience that feeds directly into The Getting of Wisdom. Laura Tweedle Rambotham, the main character, is the eldest child of a country family. She is a clever and highly imaginative child, given to inventing romantic stories for the entertainment of her younger siblings, and an avid reader. She is also both proud and sensitive and her mother finds her difficult to handle. Her mother is the widow of a barrister who supports her family in genteel poverty on her earnings from embroidery. At the age of twelve Laura is sent off to boarding school in Melbourne. Her experiences at school shock and humiliate the unworldly Laura. The girls at the school are generally from rather wealthy families and those, like Laura, who come from less fortunate backgrounds learn very early not to divulge their circumstances for fear of ridicule. From time to time Laura lets little snippets of information about her family slip out, and she suffers for it. The Getting of Wisdom was first published in 1910, and has almost always been in print ever since. Total Running Time (TRT): 7 hours, 5 min. Reading by Kirsty Leisham. Ethel Florence Lindesay Richardson (3 January 1870 – 20 March 1946), known by her pen name Henry Handel Richardson, was an Australian author.